If you need to locate a burial in Morton Cemetery, please contact our office or search www.findgrave.com. We are happy to assist you with your search. Please give us all the details you have about the deceased: full name; nicknames; names of relatives; date of birth; date of death. Through the years, cemetery record keeping has been sporadic and we need your help to fill in the blanks. If you have any records of deeds, photographs, obituaries or general information about the cemetery or those interred in the cemetery, we would appreciate you sharing them with us. Settlements of the area of Texas around the Gulf Coast and on the Brazos and Colorado Rivers began when Moses Austin, a native of Connecticut who had lived much of his life in Missouri, had the idea of colonizing Texas. With some difficulty, he got permission from Governor Martinez in San Antonio to bring 300 colonists into Texas, using New Orleans as the Gateway. He sent his son Stephen Fuller Austin to New Orleans to make contracts for transportation by way of the Gulf to the coast of Texas. On his way back to Missouri, Moses Austin became ill, lingered a few months and died June 10, 1821. Before his death, Moses Austin told his daughter and others that he wanted Stephen F. to carry out his plans. The application which Moses made in San Antonio was approved shortly after he left, and Don Erasmo Seguin was sent to the United States to tell him. Stephen heard of his father’s death and his wish for him to continue the colonization when he met with Seguin and they left for San Antonio on July 5, 1821, to meet with Governor Martinez and ask for permission to explore part of the country and select a district in which to locate his colony. Fourteen people, all who became settlers, went with them to San Antonio, arriving there August 1, 1821. They agreed to grant a league and a labor to each head of family and 640 acres to single men. A league consists of 4428 acres and a labor 177 acres. The league could be taken up in one place and the labor in another. In November 1821, five men as the first installment of Austin’s Colony built a fort in the bend of the Brazos River near the present town of Richmond. These five men were William Little, William Smithers, Charles Beard, Joseph Polly and Henry Holsten. The fort was built for shelter, a place to keep supplies and for defense in case of Indian attack. According to Sowell in his History of Fort Bend County, William Morton was the first actual settler. His league was located on the east side of the river, and his labor was on the west side near the fort, both granted to him by the Mexican Government in 1824. The land that is now Morton Cemetery was once a part of William Morton’s labor #1 where he and his family resided. In 1825, a stranger by the name of Robert Gillespie, a native of Scotland, found his way to William Morton’s home. He had met with foul play before he reached this area and because he was a fellow Mason, Morton and his family cared for Gillespie until he died on November 7, 1825. Morton buried Gillespie on his property and built a brick tomb over his grave. This tomb is believed to be the first known Masonic landmark in Texas. History tells us that this tomb was being destroyed by members of Santa Anna’s army as they passed through Richmond on their way to San Jacinto, but a Mexican officer, probably General Almonte, realized it was a Masonic tomb and stopped them. The tomb deteriorated through the years but was eventually restored by the Masonic Lodge in 1936 during the Centennial. On December 6, 1854, S.M. Swenson and Wm. S. Pierson sold to Michael DeChaumes and wife of Travis County the part of the Morton labor which they bought in 1842. (Deed book c, pp.356-357). DeChaumes made the part around Gillespie’s grave a cemetery, bordered by Fourth Street on the east, Sixth Street on the west and Ferry Street on the south. The rest was divided into lots to be sold for homes. Before DeChaumes bought the labor, several people had been buried near Gillespie. Sarah Duncan Brush (1794-1850) had come to Richmond before the revolution with her husband Elkana and children. William McGee was born in 1808 and died in 1851; he had married Mary E. Rogers in Georgia, and they came to Texas in 1850. About a year later, he accidentally killed himself with a gun and in November 1853, she married Robert Worthington. Reverius McCloy was born in 1801 and died in 1852. Several were buried in the cemetery in 1853: Lewis Lum, Hermina Radler, Thomas Sutherland, Mary Vogel, William Chambers and Charles Edwin Cushing whose monument said he died in 1853, age 27, native of Hartford, Vermont, died at Richmond, Texas in epidemic of 1853. In 1871, DeChaumes sold five acres in the DeChaumes Addition, a part of what was known as the cemetery, to three men representing the Morton Lodge #72. From 1897-1943, Morton Lodge owned and operated Richmond Masonic Cemetery, a part of what is now Morton Cemetery. After spending more than two years on the project, Morton Lodge acquired lot eleven of DeChaumes Addition which extended the boundary of the cemetery to Third Street on the east. Seven purchases were required to gain this property. In November 1898, a plat of the addition was placed on record, and the cemetery was called the Richmond Masonic Cemetery. On January 20, 1944 the Morton Cemetery Association received its charter from the State of Texas as a non-profit corporation with the purpose of preserving and maintaining the cemetery. An article in the Texas Coaster, Thursday, February 10, 1944, states that, at the meeting held January 12th, it was voted that the association be incorporated as prescribed by law. The new organization was named Morton Cemetery Association. The Masonic Lodge appointed a committee of three; Walter Minkwitz, A.E. Myers and Joe A. Wessendorff, to work with the new organization in completing a satisfactory transfer of the original portion of Richmond Masonic Cemetery. Directors and officers were elected. On December 19, 1997, the real estate transaction was finalized with Alphonso Quintero for the Morton Cemetery Association to buy one-half city block bounded by Second Street on the east and Commerce Street on the South. Today Morton Cemetery maintains its historic nature while continuing to acquire new property for future growth. In 2008, the association purchased two more properties in the city block that contained the Quintero property purchased in 1997. With the opening of four new sections containing approximately 1200 burial spaces and the acquisition of additional property, Morton Cemetery will continue to provide the community with a peaceful, historic place to inter their deceased loved ones. 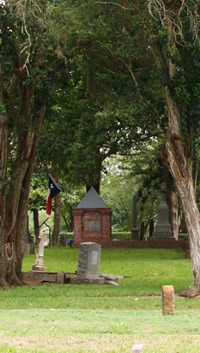 Morton Cemetery - Burial place of illustrious pioneers, including 1838-1841 Republic of Texas President Mirabeau B. Lamar (1798-1859) and one of State's first women settlers, Jane Long (1798-1880), known as "The Mother of Texas." On Labor No. 1 of Mexican land grant to William Morton, 1822 settler in advance party of Austin's "Old 300" colonists; founded 1825 when Morton buried Robert Gelaspie (Gillespie), a brother Mason who had met with foul play. Later he erected a handmade brick tomb, the first known Masonic landmark in Texas. In an 1833 Brazos flood, Morton himself met death and his body was lost. His widow Nancy inherited Labor No. 1 and sold it to Handy & Lusk, promoters of the Richmond townsite. In 1854 the parcel of land encompassing the cemetery was acquired by Michael DeChaumes. In the 1890s Morton Lodge No. 72, A. F. & A. M., gained possession of "DeChaumes Cemetery" and operated it as Richmond Masonic Cemetery until the early 1940s. It was then turned over to the newly-formed Richmond Cemetery Association, which later was retitled Morton Cemetery Association, probably to have its name conform to "Morton Cemetery" -- the name in use ever since the era of Lodge ownership. The cemetery has become a memorial to its founder. Commanded cavalry at the Battle of San Jacinto and served as First Vice President, 2nd President for the Republic of Texas. Lamar is known as Father of Texas Education. Benefactors of Fort Bend County. Mainly responsible for Fort Bend Co. Library system, Polly Ryon Hospital, T.W. Davis Park, George Ranch Headquarters, Fort Bend Co. Museum, George Observatory at Brazos Bend Park, etc. Known as Mother of Texas; Jane Long bore the first child of English parentage in the state of Texas. She is one of Austin’s Old Three Hundred and her land grant included downtown of Richmond where she ran a boarding house in town. Donated the Moore Home and property for the Fort Bend County Museum. John M. Moore, Sr. was U.S. Representative from 1905 until 1913. His grandson, Hilmar G. Moore, was mayor of Richmond from 1949-2012. Drew the white bean to gain freedom after being held captive 2 years in Mexico, following Mier Expedition. A successful business man, Davis was one of the leading citizens of Fort Bend County. Born a slave in North Carolina, Burton came to Texas in 1860. At the end of the civil war he purchased land from his former owner, Thomas B. Burton. Burton was elected and served as Sheriff of Fort Bend County from 1869-1873 and won election to the Texas Senate in 1873 and served four terms. Gillespie was the first person buried in what became Morton Cemetery. A brother mason, William Morton, erected his monument, also a first in Texas. Smith was captured at Goliad but his life was spared to do gunsmith and blacksmith work for the Mexicans. He escaped from Mexican Army during Battle of San Jacinto and later settled in Richmond where he had a hotel and livery business and served as sheriff. During the Civil War Bassett served with “Terry’s Rangers” and was twice wounded. He was the first sheriff after the Jaybird and Woodpecker feud.